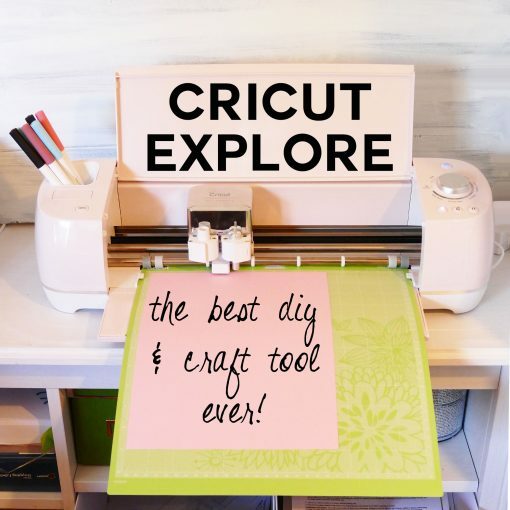 Cricut Explore: The Best DIY & Craft Tool EVER! 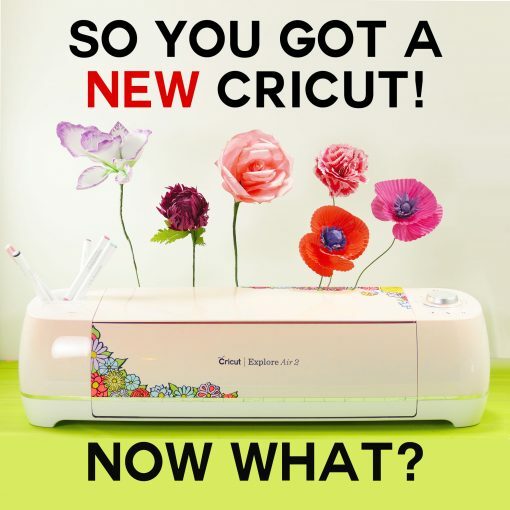 If you found this page, you may be wondering … what is a Cricut, and why is it such a big deal? A Cricut is a cutting machine that will cut exactly what you tell it to cut. You can use Cricut’s designs, or you can upload your own. You can cut paper, vinyl, cardstock, bonded fabric (or any fabric if you have the Maker), craft foam, balsa wood, poster board, and more. It can also score lines. It can even write and draw with pens. It’s AH-mazing. Several months ago I bought a Cricut Explore Air cutting machine on a whim. Little did I realize just how much it would improve my DIY and crafts and change my life. Not a day goes by that I don’t use it to either create something or help me do something else. I love it so much, I want to share it with the world. So this post contains some affiliate links, which I keep updated with the best deals, for your convenience. Read my full disclosure policy. It’s the best DIY & craft tool I’ve ever had! I am not any sort of brand ambassador for Cricut, nor have I received any equipment, materials, or compensation from them. I paid for my pink Cricut Explore Air 2 at my local JoAnn store in February 2017. As a direct result of having, learning, and using the Cricut, I received an email offering me a bonafide book deal. Real money is involved here, people! I just signed the contract. More on that later! Let that sink in for a minute. In less than four months, I’ve been able to learn to use a new tool that fills my home (and this blog) with beauty and completely recoup the cost of the tool (and then some!). I think these facts speak louder than any accolades or praise I could heap upon the Cricut. 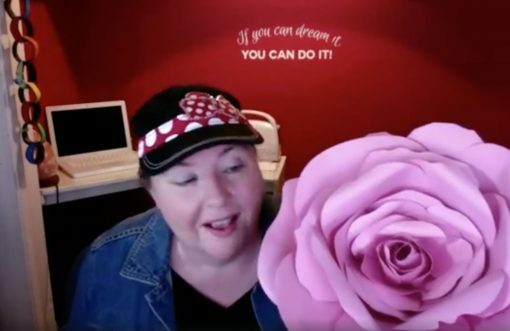 Me showing off my giant rose to my friends on Facebook! I was so proud of myself! Oh, come on, what’s the big deal about a Cricut? Can’t I just use scissors? It saves TONS of time. It allows me to create things that would have been too hard, or nearly impossible, before. This thing is crazy precise. It is freakin’ fun to make things with it, and so I make more things than ever. If you’re anything like me, you may have thought the Cricut was just for scrapbookers. I ignored the Cricut for YEARS because I’m not a scrapbooker. It wasn’t until I had the need to make a template for a class, and I was dreading all the cutting and punching that I’d have to do, that I even considered the Cricut. Somewhere, somehow, I’d once heard that you could cut your OWN DESIGNS on it. That’s when the lightbulb when off. I could cut all those templates WITH A CRICUT. I bought the Cricut that day and haven’t looked back. Can you just use scissors? For some things, yes. Other things, not really — they’re too intricate, and scissors and knives just don’t have the precision needed. And even if you could do it, it would take so long it would likely not be worth it. But is it hard to learn how to use? I learned the basics of how to use it in a few hours. I had my course templates cut by that evening. And I was uploading my first design within a few days. My first Cricut project was this pretty peony! All that in less than four months. These are all MY own designs, too. I started out with the paper flowers, because they are really quite simple. My projects grew in complexity as I did more and more and became more comfortable. It was really all SO easy and fun! 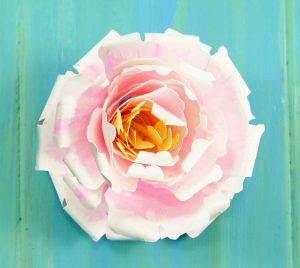 And it was those paper flowers I made just after I got my Cricut that caught the attention of a book publisher. I am currently working on a short book about DIY Paper Flowers that shows you how to make poppies, dandelions, orchids, daisies, dahlias, anemones, chrysanthemums, tea roses, and more! When it is published, I’ll be sure to make an announcement on this blog. The Cricut is simply one of the best investments I’ve ever made. So, as you can see, I’m totally sold on the Cricut Explore cutting machine. 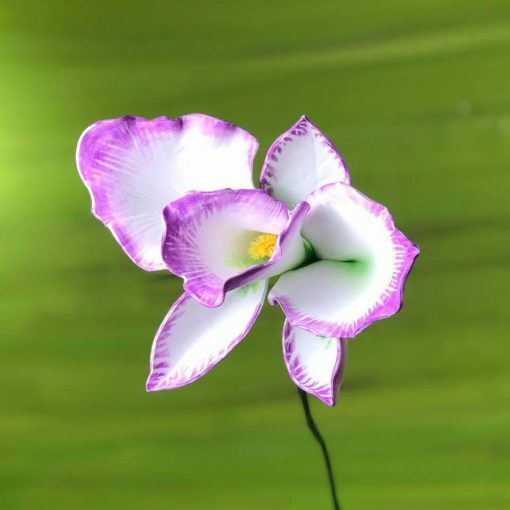 I cut out the foam for this orchid on the Cricut! I pretty much use it everyday now. It’s so useful for so many things! Even my mom and sister bought one after seeing everything it can do during one our family craft days. How can I get my own Cricut? Which Cricut do I need? This is a good question — there are different versions of the Cricut Explore. Basically, the big difference between the Cricut Explore and the Cricut Explore Air is that you can use your machine wirelessly with the Cricut Explore Air. If you don’t think you’ll want to use your Cricut wirelessly, just get the Cricut Explore One as it’s a bit cheaper (you can usually find it well below $200 at Amazon). And you can always buy the wireless adapter later if you need it. If you think you’ll be using your cutting machine wirelessly, opt for the Maker, Explore Air or Explore Air 2. What the difference? The Maker and Air 2 can cut twice as fast. I have the Cricut Explore Air 2 and now the Cricut Maker. I think they both rock, but I like the Maker the best because if can cut fabric really well. If you aren’t sure, just get the Maker. I don’t think you’ll be disappointed at all. I got a new Cricut! Now what? Hooray! Now that you have a Cricut, check out my new Cricut setup guide to get started. I walk you through the whole setup process, including your first project, and give you a suggestion for your first project from this blog. 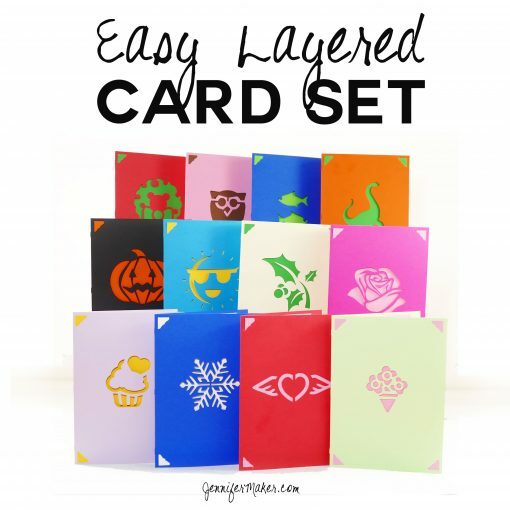 If you’ve already got your Cricut set up, check out this special project I made just for new Cricut owners — it’s a set of easy, layered greeting cards. Make one or make them all. They’re fast and simple — just cut two pieces of paper, insert them, and you’re done! 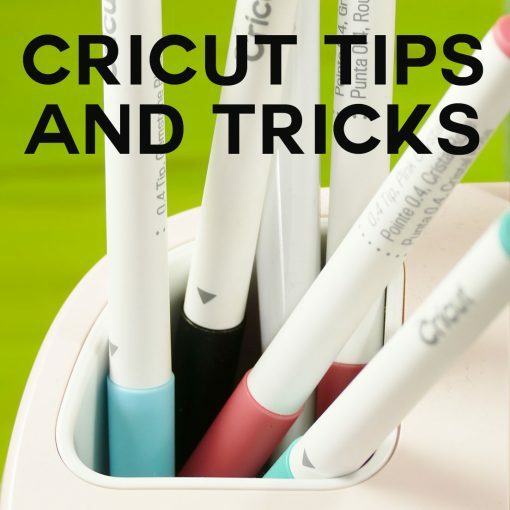 When you’re ready to learn more, check out my personal collection of Cricut tips and tricks. I’ve got something for everyone, from basic tips to really advanced stuff. Check it out before you go too far along — I promise it will save you at least one headache! I hope this has been helpful! If you get a Cricut and make something, I always love to see what you’ve made. Send it to me at [email protected] or come post it on our Facebook page. P.S. Be sure to sign up for my newsletter below. When I find exceptionally good deals on Cricut-related things, I send alerts about it out to everyone on my mailing list.